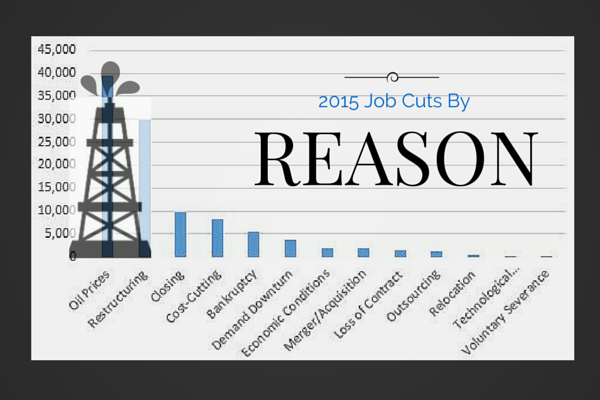 2015 February Job Cut Report: 50,579 Cuts, 38% of All Cuts in 2015 Due To Oil Prices | Challenger, Gray & Christmas, Inc. Planned job cuts declined slightly in February, as US-based employers announced workforce reductions totaling 50,579, five percent fewer than the 53,041 in January, according to the report on monthly job cuts released Thursday by global outplacement consultancy Challenger, Gray & Christmas, Inc. The February total was up 21 percent from a year ago, when employers announced 41,835 job cuts during the month. This marks the third consecutive monthly job-cut total that exceeded the comparable year-ago figure. Employers announced 103,620 planned layoffs through the first two months of 2015, which is up 19 percent from the 86,942 job cuts recorded during the same period in 2014. Once again, the energy sector saw the heaviest job cutting in February, with these firms announcing 16,339 job cuts, due primarily to oil prices. Falling oil prices have been responsible for 39,621 job cuts, to date. That represents 38 percent of all recorded workforce reductions announced in the first two months of 2015. In February, 36 percent of all job cuts (18,299) were blamed on oil prices. “Oil exploration and extraction companies, as well as the companies that supply them, are definitely feeling the impact of the lowest oil prices since 2009. These companies, while reluctant to completely shutter operations, are being forced to trim payrolls to contain costs,” said John A. Challenger, chief executive officer of Challenger, Gray & Christmas. “While oil-related companies will see profits slide, the net impact of falling oil prices will likely be positive for the economy, as a whole. Some economists are estimating that GDP could see a 0.5 percentage point boost from low oil prices, due mostly to the extra spending power among consumers. Meanwhile, companies that are big users of oil, such as transportation firms, airlines, and manufacturers of plastic and paint products will see higher profits thanks to cheap oil,” noted Challenger. Indeed, in a January survey by the National Association for Business Economics, 50 percent of in-house corporate economists said that falling oil prices have already had a positive impact on their firms. Cheap oil does not yet appear to be helping stem the tide of job cuts in the retail sector, which saw the second highest number of job cuts in February with 9,163. Employers in the sector have announced 15,862 job cuts, so far this year. That is little changed from the 15,242 retail job cuts announced in the first two months of 2014. “So far, falling oil prices have not resulted in higher retail spending. However, that is not necessarily the cause behind ongoing job cuts in retail. Falling oil prices might stave off job cuts for some retailers but, the fact is, some retailers are beyond the point where cheap oil will help turn things around. For example, the heaviest retail job cuts last month were the result of RadioShack’s long decline, which culminated in bankruptcy and liquidation,” said Challenger. While retail has not yet been lifted by falling oil prices, recent hiring announcements indicate that automotive and transportation firms are starting to see the benefits. Last month, transportation firms announced plans to hire 5,236, while automotive firms plan to add 3,185. “These reports probably represent just a small fraction of actual job creation, since most employers do not formally announce hiring plans,” noted Challenger. In all, announced hiring plans totaled 14,574 in February, up 66 percent from 8,774 in January.